Let’s start with dessert first, as all the best meals do. Pastiera Napoletana dates back to the pagan days when it was made to celebrate the coming of spring. Nowadays it’s still a spring cake, hardly missing on Neapolitans’ Easter tables. It’s a shortbread cake filled with a paste of ricotta cheese, boiled wheat, eggs, spices and candied fruits. The spices used on the original recipe are cinnamon and orange blossom water. Torta Caprese.– A flour-free thin, crusted outside and deliciously soft inside. You simply can’t help but fall in love with this dessert. 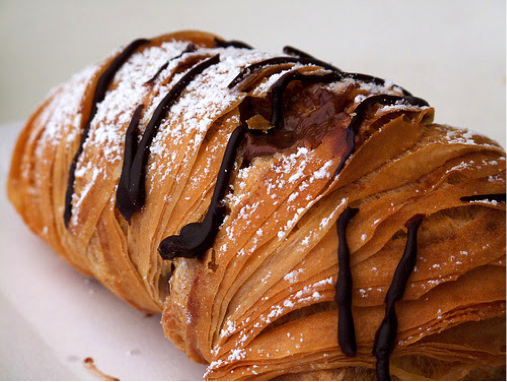 Sfogliatella – No trip to Naples or Amalfi would be complete without trying one of these delicious pastries for breakfast. The multi layers of light dough are formed into the shape of a seashell and offer the perfect crunch to compliment your morning cappuccino. Fried Zucchini Blossoms – This is a seasonal delicacy that always seems to magically appear on the Amalfi Coast no matter the time of year. In Campania, they stuff these tender orange flowers with ricotta and batter and fry them. You will not find these on the so-called “tourist menu” which offer things like Chicken Parmigiana, so don’t forget to ask if they are available! Stuffed Calamari or Cuttle Fish – stuffings are as varied for this little squiggly fish as the day is long. However, the stuffing is what makes this dish. 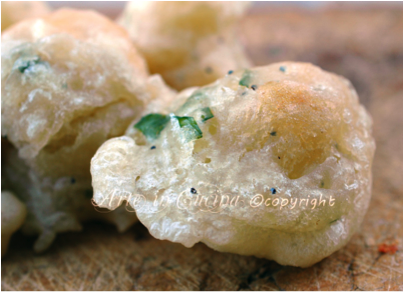 Breadcrumbs are the base to which various ingredients such as pignoli, raisin, gorgonzola, onions, garlic and seasoning are added. They are then baked and served as an entrée. They are cooked to perfection when the fish just melts in your mouth. Zeppole – A personal favorite to many. Deep fried dough balls. Neapolitan pizza (pizza napoletana) is made with tomatoes and Mozzarella cheese. It can be made with ingredients like San Marzano tomatoes, which grow on the volcanic plains to the south of Mount Vesuvius, and mozzarella di bufala Campania, made with the milk from water buffalo raised in the marshlands of Campania. Genuine Neapolitan pizza dough consists of wheat flour, natural Neapolitan yeast or brewer’s yeast, salt and water. The dough must be kneaded by hand or with a low-speed mixer. After the rising process, the dough is formed by hand and may be no more than 3 millimeters (0.12 in) thick. The pizza must be baked for 60–90 seconds in a 485°C (905°F) stone oven with an oak-wood fire. When cooked, it should be crispy, tender and fragrant. There are three official variants: pizza marinara, which is made with tomato, garlic, oregano and extra virgin olive oil, pizza Margherita, made with tomato, sliced mozzarella, basil and extra-virgin olive oil, and pizza Margherita extra made with tomato, mozzarella di bufala from Campania, basil and extra-virgin olive oil.